Scott’s Run Nature Preserve is one of several Potomac River Gorge designated sites along the Virginia palisades of the Potomac River. This ancient waterway has an estimated age of 600 million years based on dating by the U. S. Geological Survey of exposed metamorphosed sedimentary rocks in the Mather Gorge Formation at Great Falls Park. Many geological events over hundreds of millions of years influenced the topography of Scott’s Run today, even back before the existence of the Atlantic Ocean, when the continental plates collided and the Appalachian Mountains were created and eroded. The current drainage system of the preserve developed more recently. Approximately 10,000 years ago, the Laurentide Ice Sheet reached as far south as Pennsylvania. Although the glaciers never made it into Virginia, the thick ice sheets to the north and the sheer volume of their melt water played a major role in cutting drainage systems and watersheds into the Potomac River area. Cooler climates associated with the glaciers pushed some northern plant species such as Eastern Hemlock, Tsuga canadensis, south into Virginia. The terraces and coves cut into the north-facing, steep bluffs of Scott’s Run Preserve provided the cool microclimates necessary for the ancient hemlocks to survive there these many thousands of years. Like so many of the hemlocks in other parts of Virginia, those in Scott’s Run Preserve are suffering or have succumbed to the hemlock woolly adelgid. Recent treatments to destroy the insect are proving successful, and young hemlocks are showing up in the preserve. Park management has scheduled future treatments, so there is reason to hope that the Eastern Hemlock will remain as a living souvenir of the last ice age. The political origin of the preserve took less time than the glacier and included the singing of “This Land Is Your Land” by citizen activists. This drama occurred after the 1966 death of the owner of the property referred to locally as the “Burling Tract”. 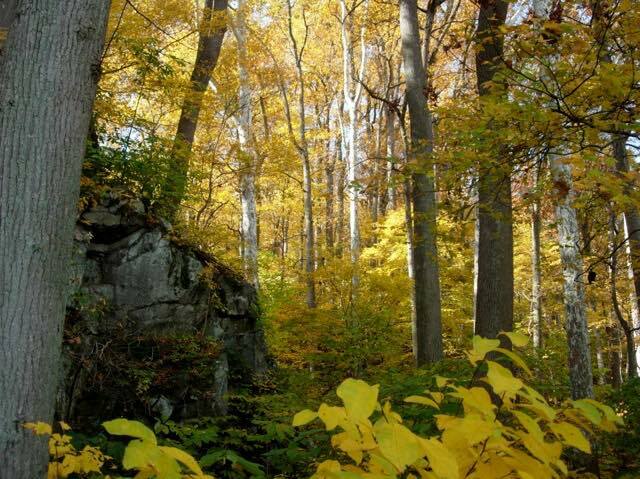 According to a June 2009 article in The Washington Post, Edward B. Burling Sr., the co-founder of a Washington DC law firm, had a cabin in what is now Scott’s Run Nature Preserve. He enjoyed both the solitude of the site and its convenience as a meeting place for Washington’s power-brokers, but he refused to allow telephone lines to his cabin because he did not wish to cut of any trees. He visited the cabin into his 90s. After Burling’s death, the property was purchased for $2.4 million by a local developer who intended to build luxury homes but preserve half of the land for walking trails. When neighbors saw a public planning commission notice tacked to a tree, efforts to save the Burling Tract from development began in earnest, leading to peaceful protests along Georgetown Pike and local students carrying petitions door-to-door. The activists wanting to preserve the site had to persuade the Fairfax County Planning Commission, the Northern Virginia Regional Park Authority and the Fairfax County Park Authority to change their positions. They were aided by support from The Nature Conservancy and Virginia Senator William B. Spong Jr. Positive coverage from The Washington Post and The New York Times helped the cause. Virginia Governor Lynwood Holton appealed to the developers to halt tree cutting during price negotiations with the county. During the tree cutting, activists gathered to sing, beat on pans, and show support for preserving the site. The land was purchased on Sept. 5, 1970 for $3.6 million and the tract became the Dranesville District Park. 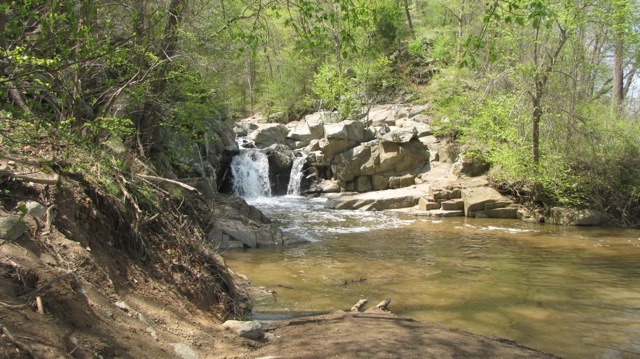 It was later re-named Scott’s Run Nature Preserve to recognize the creek whose watershed begins at Tyson’s Corner and enters the Potomac River over a picturesque 15′ waterfall. Growing developments around Tyson’s Corner and elsewhere in the watershed are increasing runoff and creating serious erosion problems along the banks of Scott’s Run inside the preserve. Marijke Gate, a member of the staff at nearby Riverbend Park that oversees Scott’s Run, indicates that mitigation efforts are planned along the banks of Scott’s Run upstream, outside the preserve’s boundary, by the Natural Resource and Protection Division of the Fairfax County Park Authority. John Callow, the manager of both areas, will soon be implementing new resource protection initiatives at Scott’s Run. A new park map is being created to help protect fragile resources. Off-path “social trails” that have been forged by the increasing numbers of visitors will be closed to allow plant communities to recover, especially near streams and pools. Since the stream running through the preserve originates at Tyson’s Corner, the water is only of moderate quality. Regardless, illegal water recreation compromises stream-bank plant communities, and off-leash pets create problems for wildlife and fragile off-trail plant communities. Ongoing activities both to educate preserve visitors and to engage volunteers include wildflower walks by Riverbend Park staff, invasive plant removal efforts, watershed clean-ups and deer management efforts. The MEWE (meaningful watershed experience), a Fairfax County program, requires all 7th graders to learn about water quality, live stream organisms, biodiversity along the floodplain and land use. Although not fully documented as yet, the deer management program appears to be providing some relief for the understory on slopes and in the upland forest. Like invasive plant removal, success requires ongoing programs to keep ahead of resource damage. Native plant enthusiasts will find great enjoyment in the large diversity of plant species within the 384-acre preserve. Quoting a passage from Finding Wildflowers in the Washington-Baltimore Area, by Cristol Fleming, Marion Blois Lobstein, and Barbara Tufty: “Botanist Albert Radford of the University of North Carolina described the area as ‘the most diverse forest, from a plant community and species viewpoint, seen in the entire Piedmont. 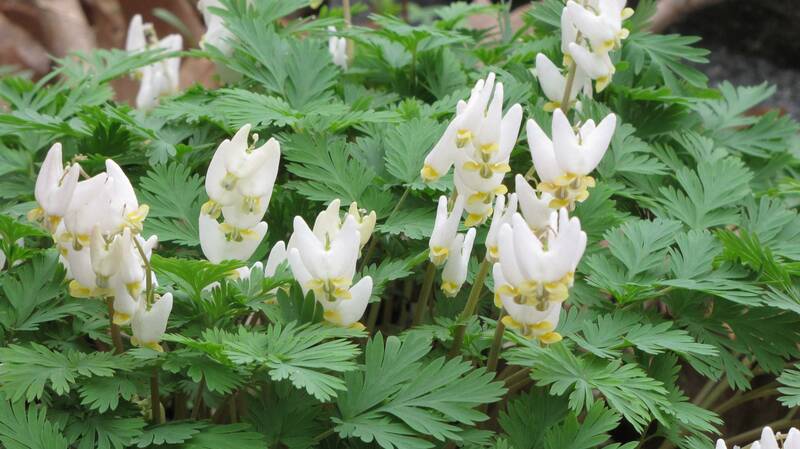 '” A plant survey done prior to 1995 records 175 species of flowering plants and 20 species of ferns. Every change in soil and moisture conditions is echoed by a change in plant communities that thrive in those conditions. The Acidic Oak/Hickory Forests of the dry, upland areas host Scarlet Oak (Quercus coccinea) and Chestnut Oak (Q. montana) with an understory of ericaceous plants such as Mountain Laurel (Kalmia latifolia) and Trailing Arbutus (Epigaea repens). The Mesic Mixed Hardwood Forest occupies land a little less dry, but still acidic and infertile. Trees in this area include American Beech (Fagus grandifolia), Tulip (Liriodendron tulipifera), and White (Q. alba) and Red Oaks (Q. rubra) with an herb layer of Christmas (Polystichum acrostichoides) and NY Ferns (Parathelypteris noveboracensis). The Basic Mesic Forest-Rich Slope Forest includes fertile ravines and river bluffs supporting Sugar Maple (Acer saccharum), American Beech (Fagus grandifolia), Hemlock (Tsuga canadensis) and Bitternut Hickory (Carya cordiformis), with understory stands of Pawpaw (Asimina triloba), and Spicebush (Lindera benzoin). 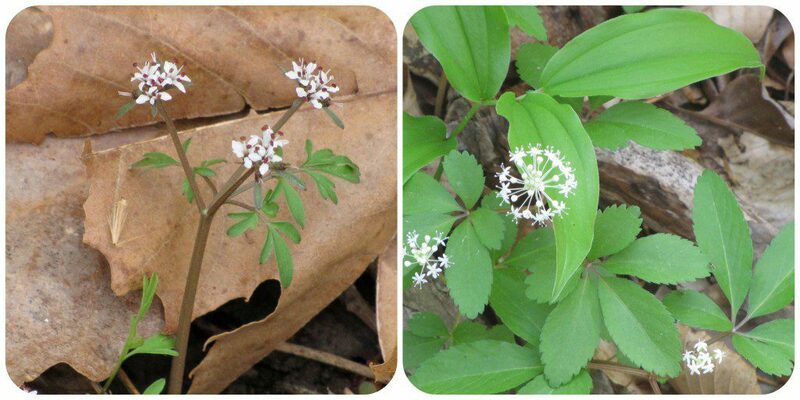 A rich herb layer associated with this community includes Bloodroot (Sanguinaria canadensis), Canada Waterleaf, Hydrophyllum canadense, Heart-leaved Foamflower (Tiarella cordifolia), Blue Cohosh (Caulophyllum thalictroides), Star Chickweed (Stellaria pubera), and Bluets (Houstonia caerulea). 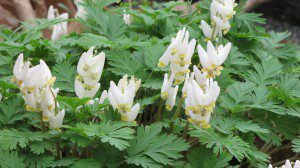 Hikers looking to welcome spring will be astounded by the wealth of early blooming native plants, and it just gets better as the seasons progress. From the earliest appearance of Skunk Cabbage (Symplocarpus foetidus) and Harbinger-of-Spring (Erigenia bulbosa) through Dutchman’s Breeches (Dicentra cucullaria) and Virginia Bluebells (Mertensia virginica), Wild Hydrangea (Hydrangea arborescens) and Downy Rattlesnake Plantain (Goodyera pubescens), Cranefly Orchids (Tipularia discolor) and Elephant’s Foot (Elephantopis caroliniana) right through to late season goldenrods and asters and winter greens, Scott’s Run is a treasure to preserve.